The Left are disappointed; the Toxic Twins – Judith Collins and Steven Joyce – failed to seize leadership of the National Party. The coldly psychopathic eyes of Collins, and the menacingly malignant grin of Joyce, will not be scaring New Zealand voters witless in 2020. Instead, the boyish grin of Simon Bridges will be leading the National Party – until he won’t, after their inevitable defeat at the next election. 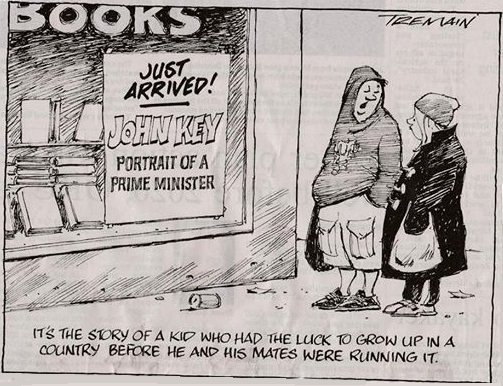 Key made those comment in January 2008 – a little over a decade ago. Since then, migration has risen sharply under National’s watch, pushing up demands on housing, education, healthcare, roading, and other services/infrastructure. In essence, Bridges referenced a problem that no longer exists. 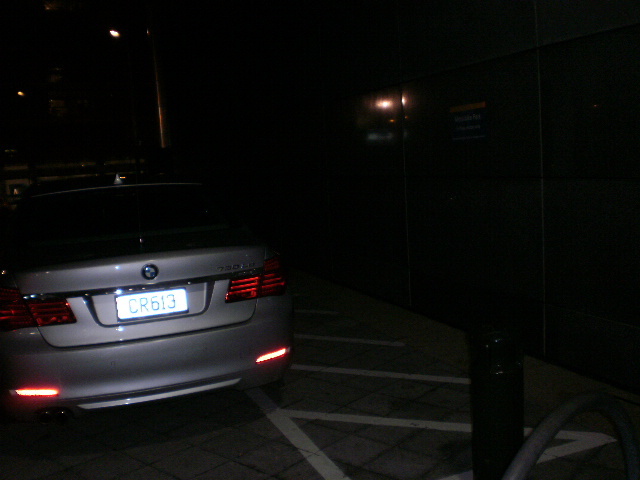 Bridges’ “progressive moves” on electric vehicles are in his mind only. “So far Simon Bridges has seemed keen to appear in every possible photo-op, and be seen to do something without actually committing any resources or policy that would be effective. It can hardly be considered ambitious. But it does seem to suggest he knows that the announcement is totally ineffective and won’t lead to an increase in the number of electric vehicles. A year later, only eight of 2,000 vehicles bought for various government bodies were EVs. That was the “legacy” that Simon Bridges ‘crowed’ about to John Campbell. Is it any surprise the Greens wanted nothing to do with National during coalition talks last year? Simon Bridges, Leader of the National Party: more of the same. This blogpost was first published on The Daily Blog on 1 March 2018. 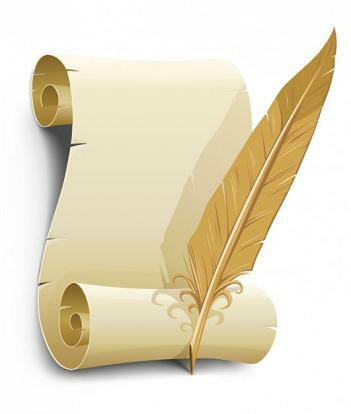 Letter to the Editor: National’s blighted future? 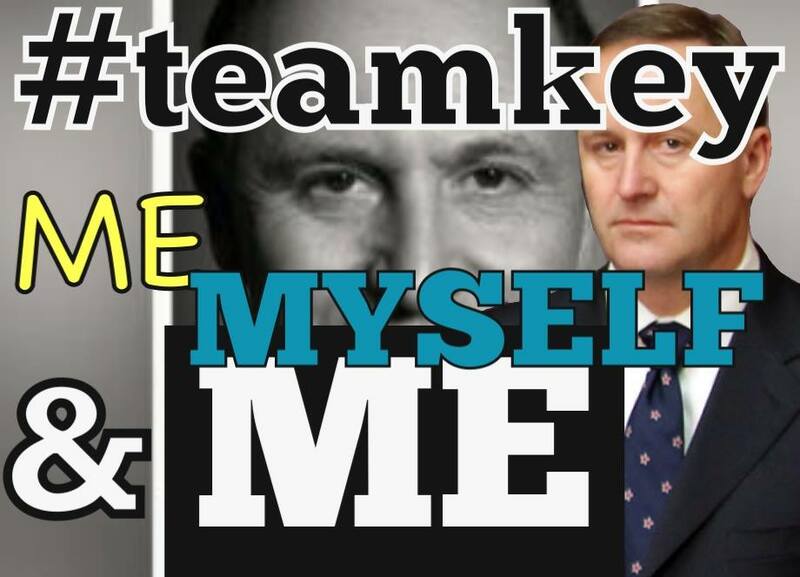 Once National is defeated, Key will be gone, as he promised in January 2011. That will leave National seeking not just a new leader – but a change in culture. 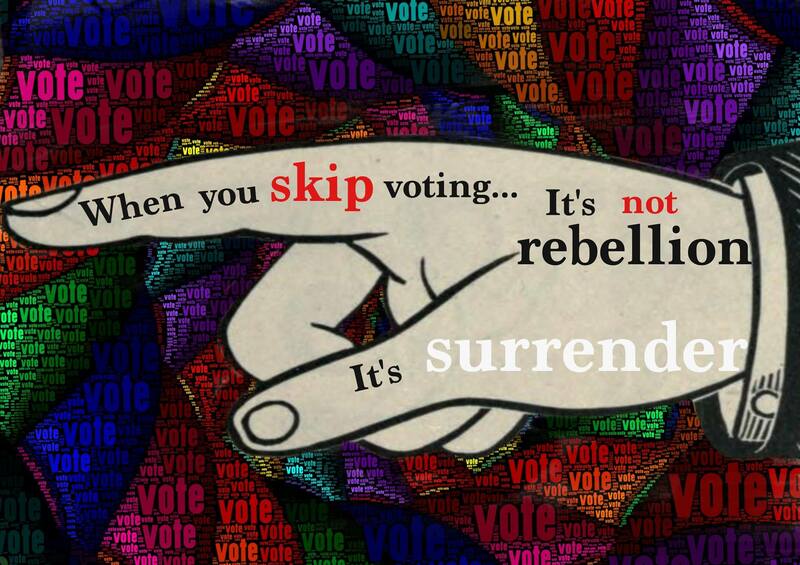 All the dirty tricks; black ops; media spin-doctors; sleaze; ministerial mis-use of power – all will have to go. The new Leader will be given a broom, and boy oh boy, s/he’ll be busy sweeping clean. If s/he doesn’t, the legacy of the Collins-Ede-Slater-Lusk-Key cabal will remain, a Blighted Future for a once proud party. Ironically, National is the party of “personal responsibility” and the responsibility for cleaning up their foul mess lies solely with them. The Right-wing – strong on crime! 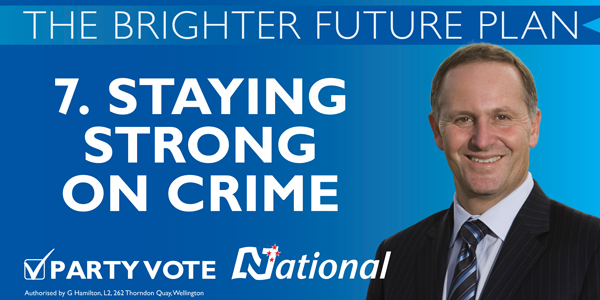 National, ACT, and the Right, generally, are renowned for being “tough on crime”. What follows are just a few examples, to illustrate National/ACT’s “toughness”. 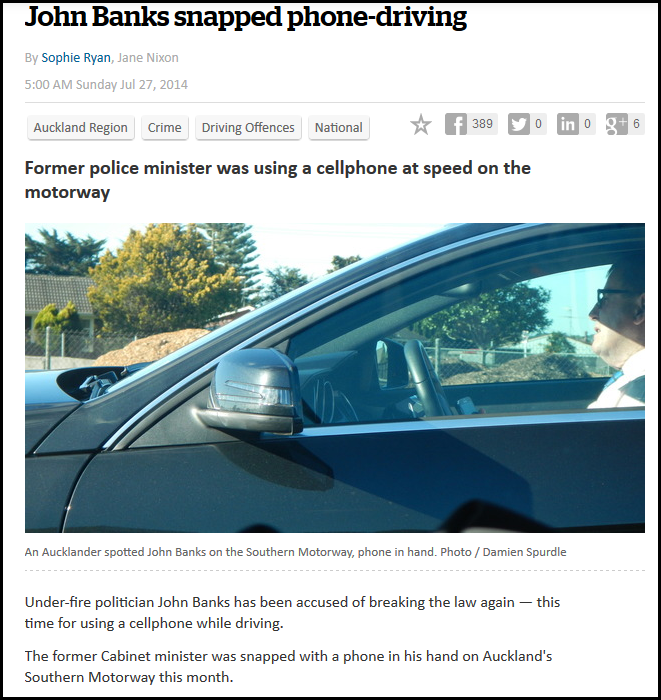 Ms Hauiti isn’t the first MP to mis-use tax-payer’s money, and most certainly won’t be the last. Talk about “accident prone”. Really, I think he needs a holiday away from it all for a while. Perhaps Dear Leader can lend him the keys to his bach… in Hawaii. Giving away one of our few remaining real holidays is a fight National wants to avoid. They understand that whilst Kiwis like to shop, that paradoxically, they also like their holidays. Who wants to give away a family day at the park, in summer, watching the kids play sport – so that we can spend those same summer days couped up in a shopping mall? Or in the office? Or factory? Or service centre? The Bridges Solution? Turn a blind eye to the law. An inconvenient law. Well, there ain’t none. Not if you’re a National/ACT member of Parliament. Ponder this though; if National/ACT are exhibiting this kind of arrogance after only two years – what on Earth will they be up to if they win a Third Term?! 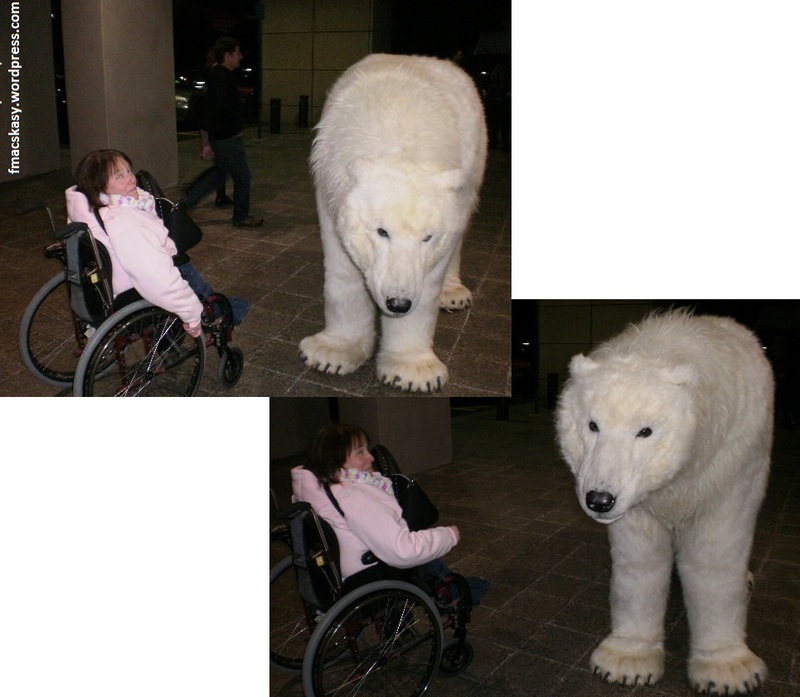 This blogpost was first published on The Daily Blog on 31 July 2014. 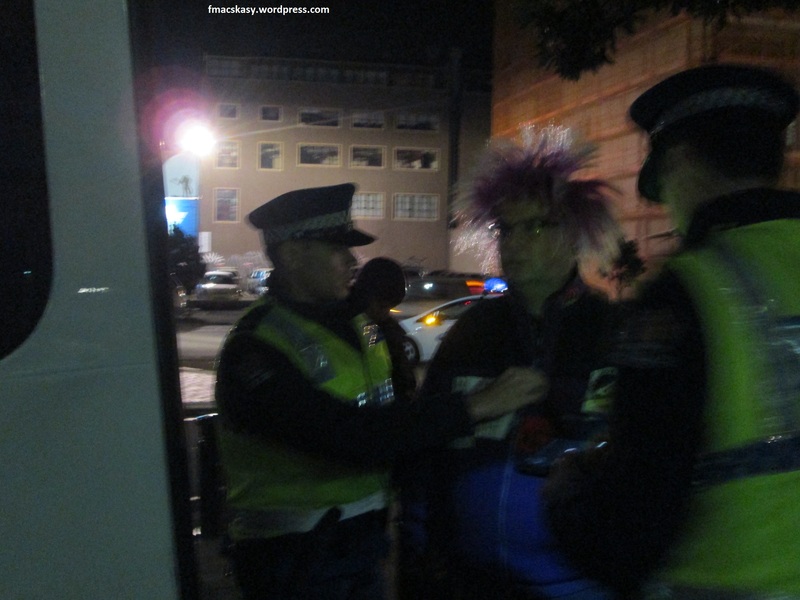 Protest against National Party soiree results in one arrest – for bugger all! 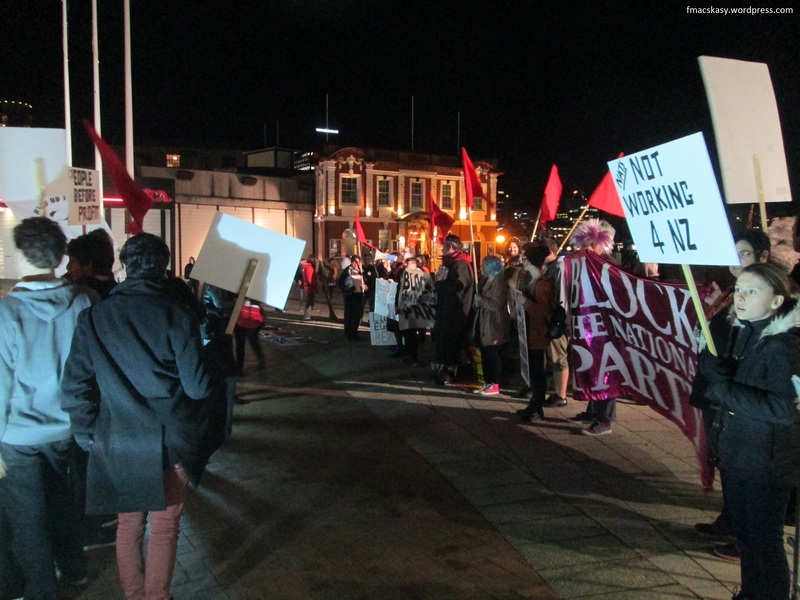 NZ, Wellington, 29 June 2014 – About one hundred people took part in a peaceful – if noisy – protest on a Saturday night outside Wellington’s sea-front museum, Te Papa. 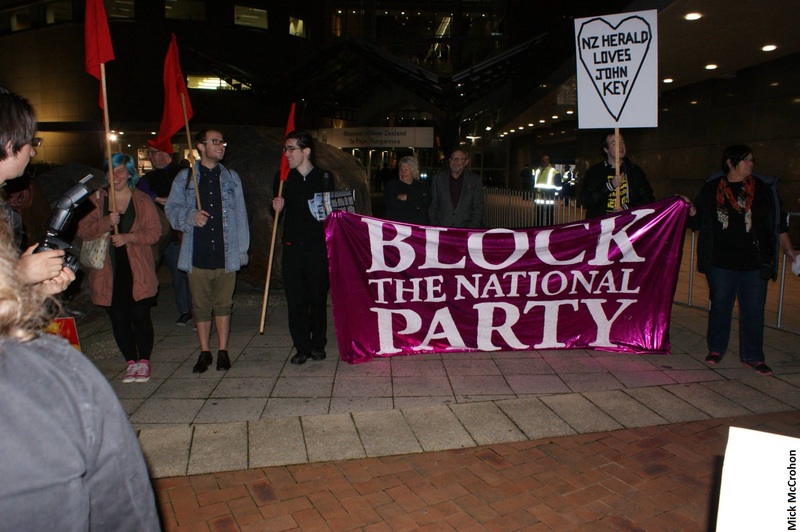 The National Party had booked Te Papa for a cocktail evening, with flash tuxedos and expensive frocks de rigueur for the evening. Needless to say, low-income families and beneficiaries were not overly represented at this exclusive soirée. 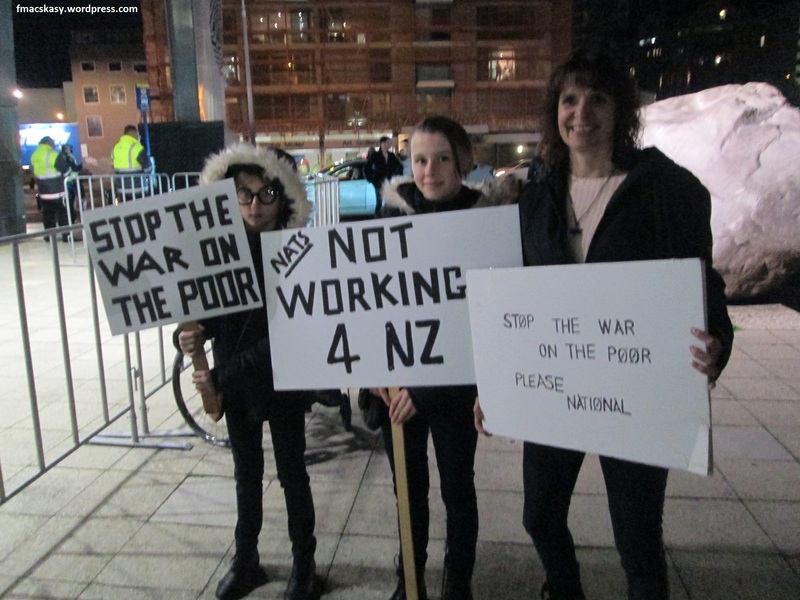 The protest action was organised by Pōneke Action Against Poverty, a recently formed grass-roots pressure group fighting the widening gap between rich and poor in Aotearoa-New Zealand. At the same time this Government is supporting the wealthy to become richer. From tax cuts in 2010 to asset sales and the ongoing expansion of mining, drilling, and fracking, this government is supporting big business while ignoring those who need help. 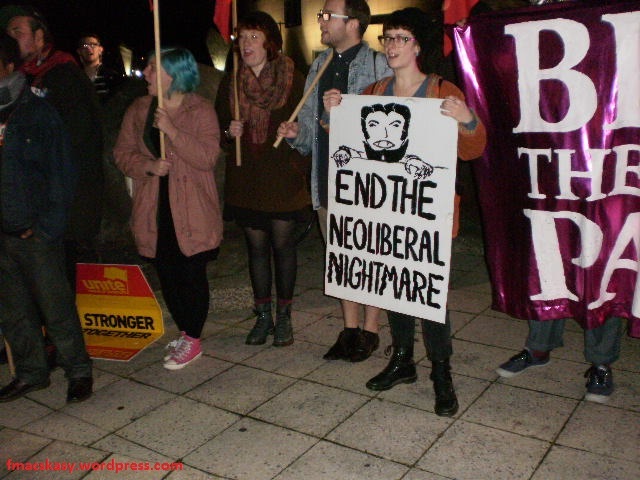 Judging by the style of clothing worn to the Te Papa cocktail party, poverty was not a problem for attendees. This was a salient reminder to those middle class aspirationists and One Percenters that there is real, palpable anger out in the community. 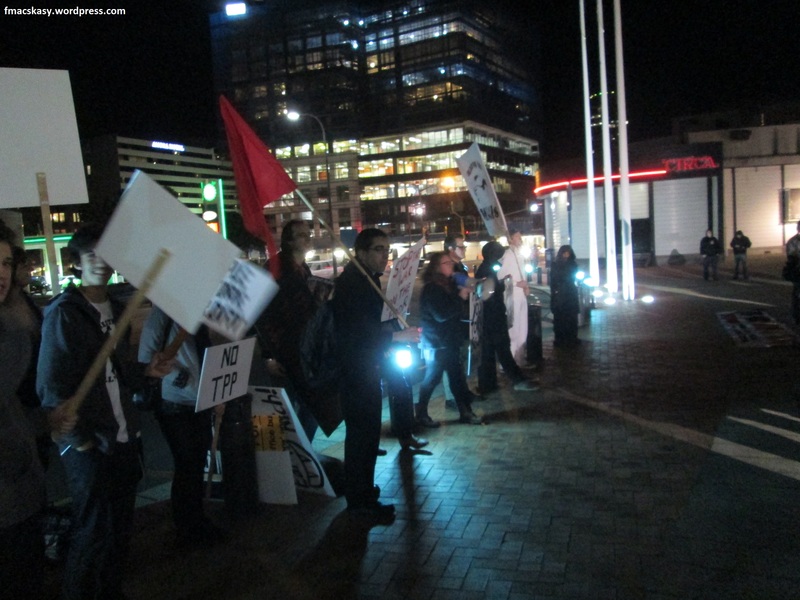 “When workers rights are under attack – Stand up fight back! It would be a mistake to believe that young people are disinterested in the critical issues of the day. They were knowledgeable, and they were articulate. They were firm in their opposition to mining and drilling in our national parks and marine reserves. They are the future hope for our country. 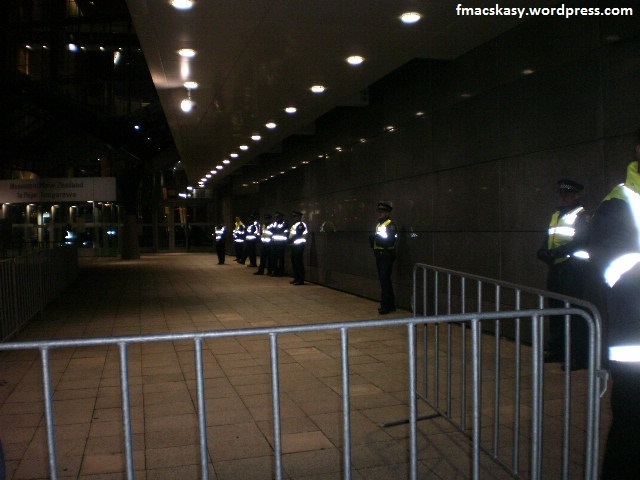 Police presence numbered around ten to a dozen, with additional private security guards to boost numbers. The One Percent must be very afraid of their tenuous hold on power. 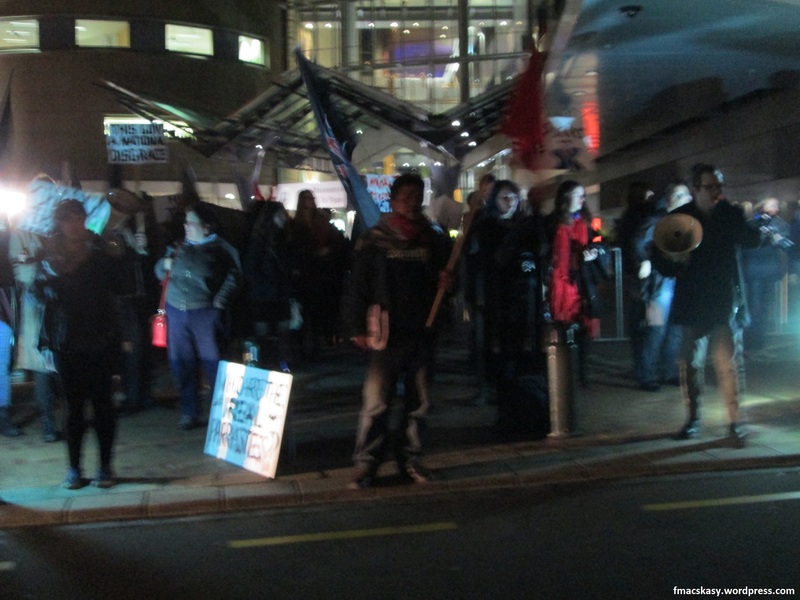 The protesters re-grouped to face the courtyard in front of Te Papa. By this time, their numbers had swelled to around a hundred. They were no less vocal, as National Party members, Ministers, and assorted MPs kept arriving. I asked the question three times. He walked past, with no answer. 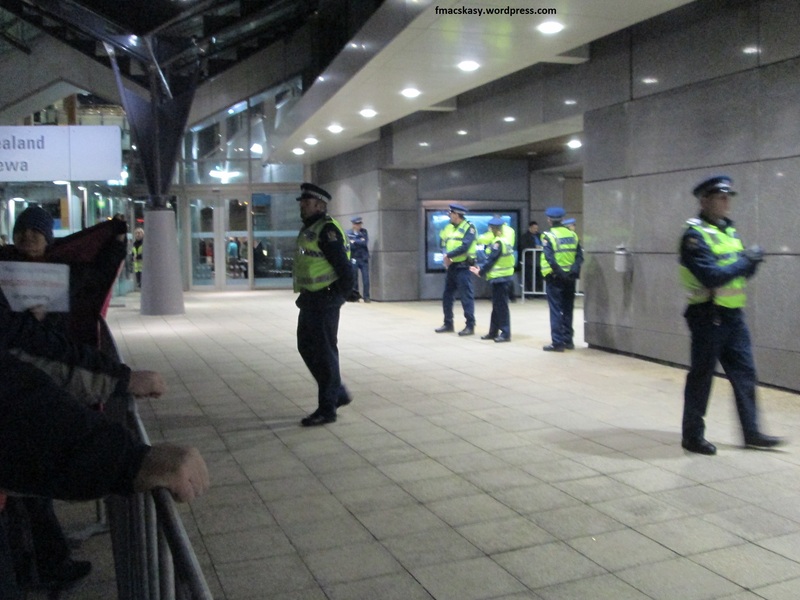 Towards the end of the protest, Police arrested one person – Darren – for “Offensive Behaviour”. Darren had allegedly used a can of “spray string“, aimed at National Party members. As this blogger was present and witnesssed the incident, Darren did not “spray paint” the museum, and reports to that effect are untrue. There seemed no apparent reason for hand-cuffing Darren. He gave no resistance, and he fully complied with their instructions. 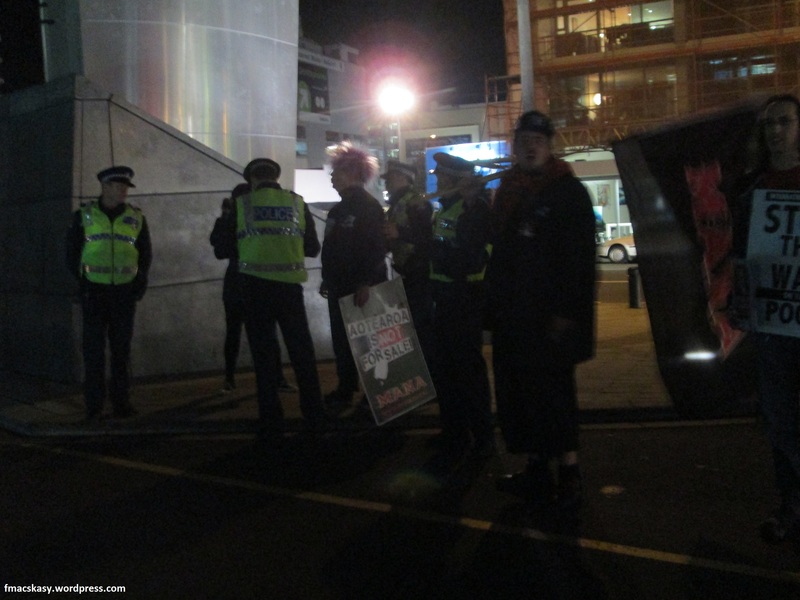 About half an hour later, as it became apparent that no further guests were arriving to the function, the protesters packed up and moved away without further incident. On Sunday evening, following Darren’s arrest and release, I interviewed him on-line to ascertain what had happened. Frank: Firstly, can you tell us what happened last night [Saturday]? 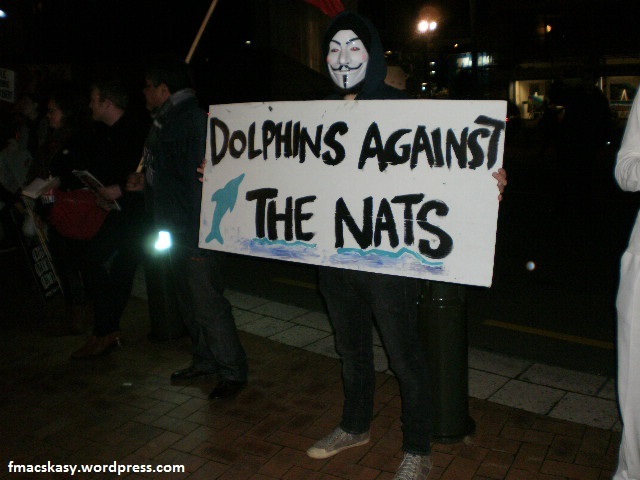 Darren: I was at a protest against the 2014 National Party Conference outside of Te Papa, where National Party Members were meeting for an evening function. 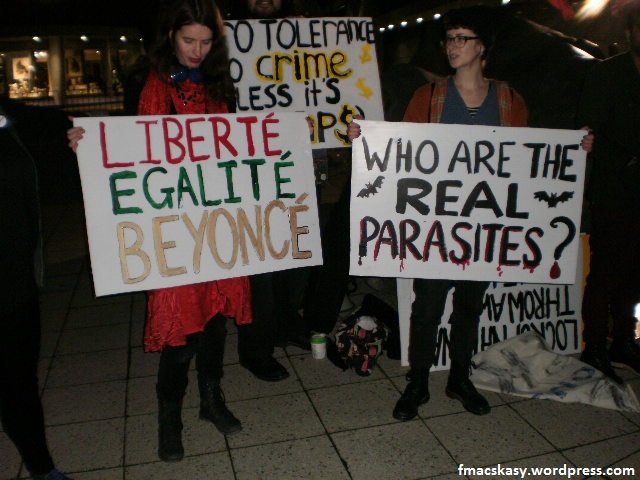 Frank: Can you tell us what the protest was about? Darren: The protest was about a number of issues that people are angry at the National based government for pushing through despite public opposition, including the selling of prospecting rights on marine reserves to foreign multinational oil companies. 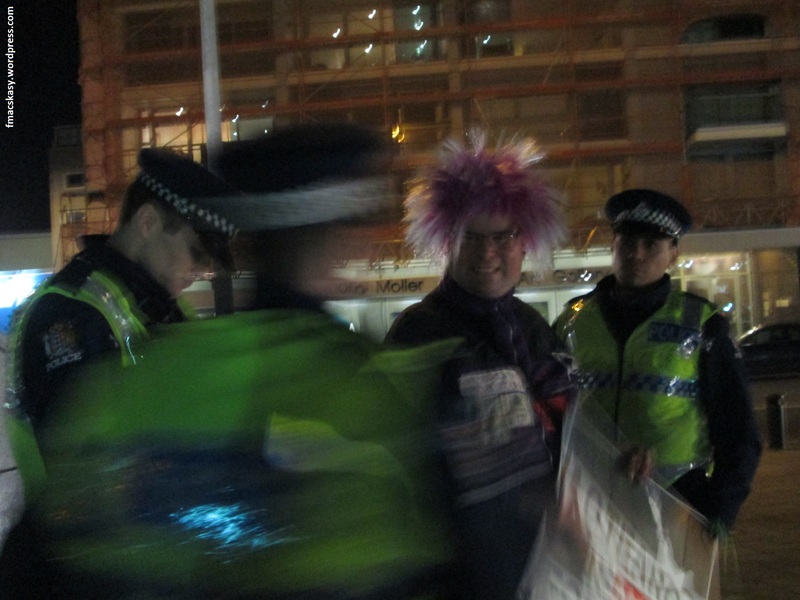 At approximately 7:30pm I was arrested for ‘Offensive Behaviour’. Frank: I was present when you were arrested. You used one of those party “string” spray-cans. 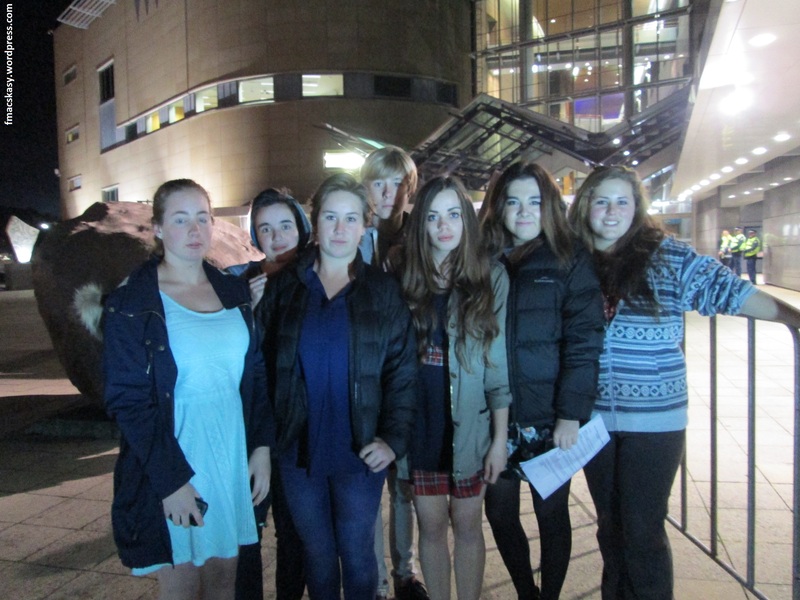 You weren’t spray painting Te Papa, as some reports have stated, were you? Darren: Yes at one stage I was holding a “string” spray-can. I did not spray paint the building. 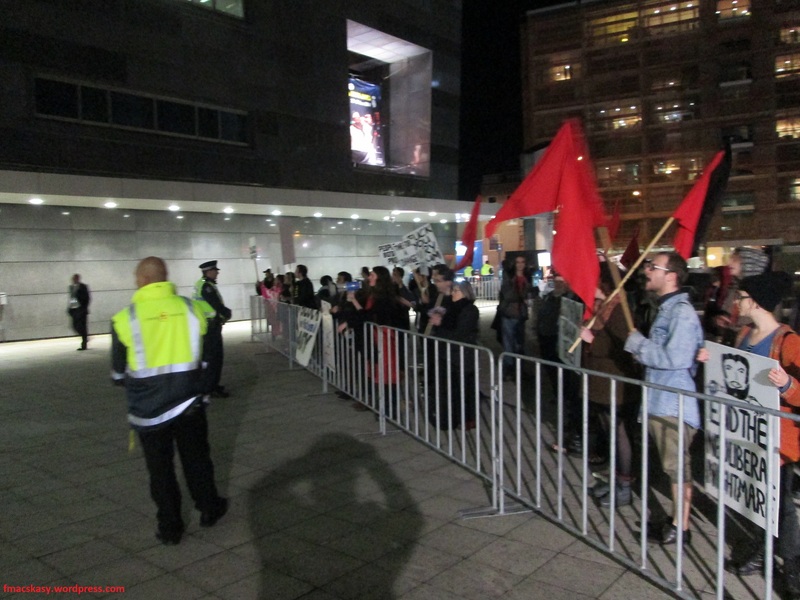 I, like other protesters, was offended by the behaviour of our so-called National Museum Te Papa that allowed an undemocratic right-wing political party, who I as a Citizen of New Zealand am opposed to, to book their premises. Frank: Indeed, many people present can vouch that the spray can you were holding was not a paint can. So, what happened when you were arrested? You were handcuffed? Darren: When I was first arrested a police officer took hold of my arm, I did not resist. They ‘patted me down to search me and confiscated all my personal items, wallet, cellphone, flat keys etc. I was ordered to put my hands behind my back and they put metal handcuffs on me. 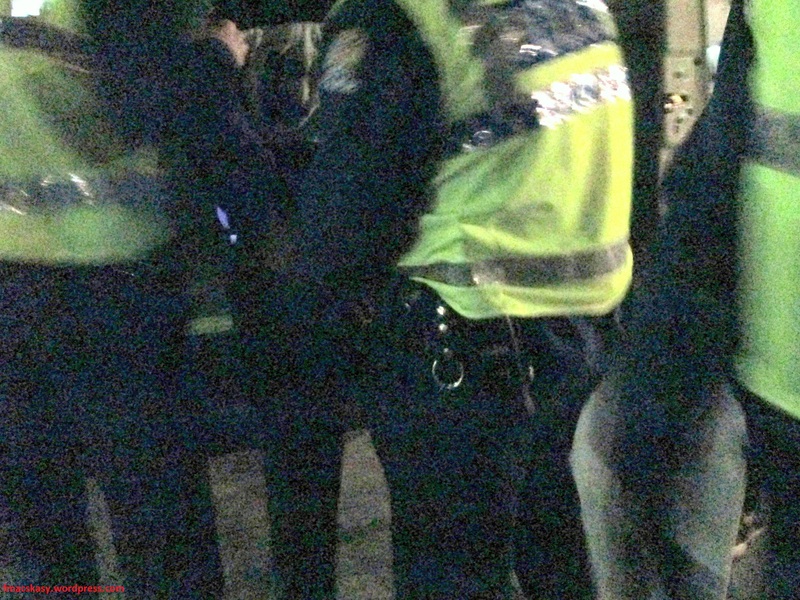 I was then told to enter the police van, where I sat for what felt like about ten minutes. Then I was let out and told to get into the back of a police car. Frank: I was present when that happened, Darren. There seemed to be some uncertainty that the police charged you or not. Did they say they were charging you with anything? Darren: I asked then what they were arresting for and was told the offense was ‘Offensive Behaviour’. They started asking me questions and I told them that I was remaining silent, which is one of my ‘Miranda Rights’. Frank: Were you still handcuffed when they transferred you into the police car? Darren: Yes, by that stage my wrists were bruised from the cuffs. The office sitting next to me attempted to put a seat belt on me, which would not fit because of the cuffs. I told the police that the cuffs were hurting my wrists but they would not take them off until I was processed at the police station some minutes later. Frank: Ok. So all up, how long do you think you were handcuffed for? And can you confirm that you offered no resistance whatsoever? Because when I was present from the moment they caught you, using the “string” spray can, to the point they put you in the paddy-wagon, you showed no resistance at all. Was that your behaviour later, after they transferred you to the police car? Darren: I think I was handcuffed for about twenty minutes, although it was hard to tell exactly as one of the first things that they confiscated was my wrist watch. 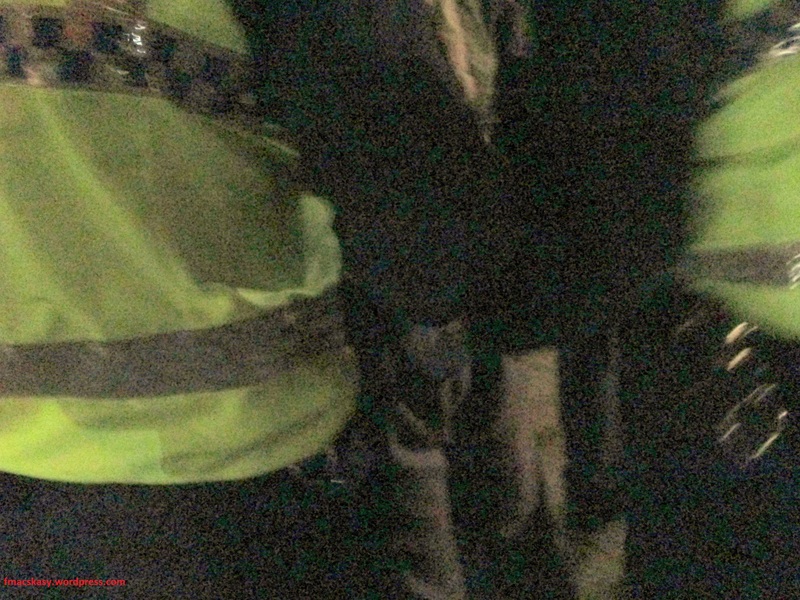 The only time during the whole ordeal in which I showed any resistance was near the beginning when you were nearby, the policeman took hold of my right arm, which was technically an assault. I simply shrugged to get him to loosen his grip, which did not work. From then on I offered no resistance whatsoever and I remained silent for most of the time except to answer questions about my identification and residence etc and to make some general references, ie about the weather etc which had no bearing on my conviction. Frank: Did they take you to the station to be formally charged and processed? Darren: Yes, to my limited knowledge, it was done by their ‘book’. They processed me, gave me the formal charge of ‘Breach of the Peace’, photographed me, asked my intimate questions about my physiological and mental health, took my shoes, my belt and my ear rings and said that all my possessions would be kept in their safe while I was put into a holding cell for two hours. I was not allowed a telephone call or to contact legal representation, even though they mentioned that the police could provide me with ‘free lawyers’. Frank: Did you ask to contact a lawyer or anyone else? Darren: They briefly mentioned a lawyer when they were reading me my ‘rights’. 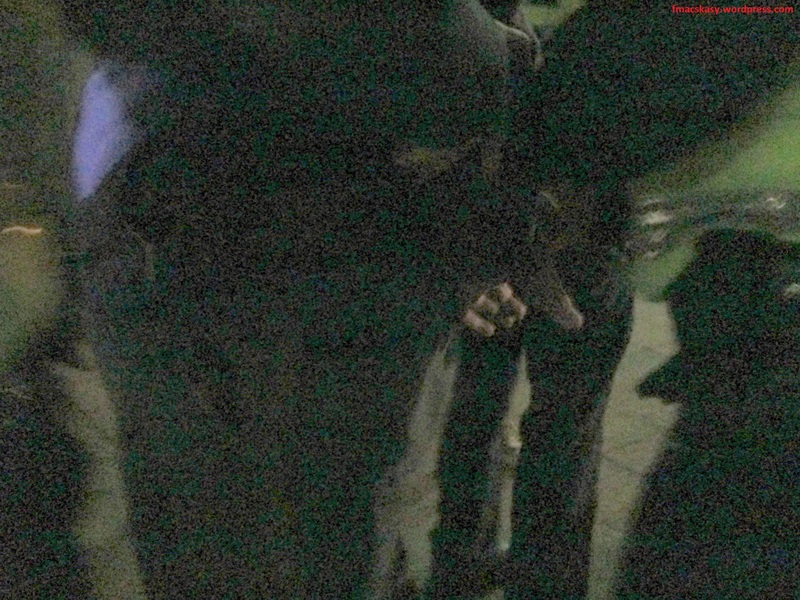 I chose to remain silent except when an officer was padding me down and confiscating all my remaining property. I told the officer that when people are that intimate with me that they normally buy me a restaurant meal and a few drinks. The offer of a lawyer was not made again, and I was photographed and then marched into a holding cell, where I was left with no food, drink or telephone for about two hours, despite me telling them that I am diabetic. Frank: So what time were you finally released? And have you been given a date to appear in Court? Darren: It was about 9:40pm when they returned my watch and all my possessions. I think that they were annoyed that I remained silent and did not provide any resistance. According to my Breach of Peace Release Notice: “Subsequent enquiries have now established that: *(a) No charge will be laid against you in court and you are now free to leave the Police Station, OR” (sic) The notice was signed by the officer in charge. 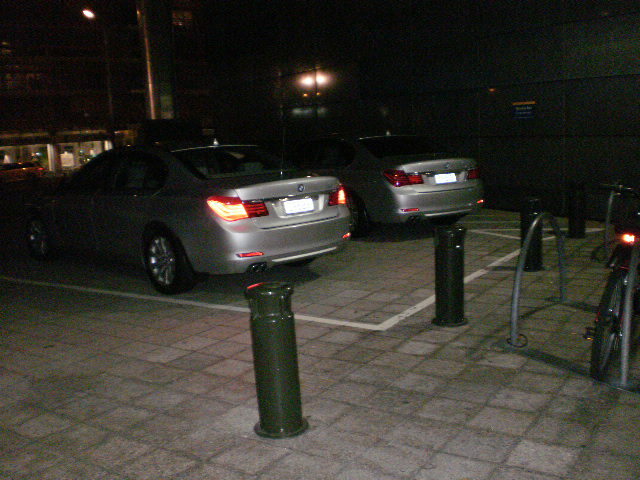 I was then marched out the vehicle entrance of the police station and told to go directly home. Frank: How are your hands, after being handcuffed? Darren: I did some wrist flexing exercises in the holding cell, that I remembered from going to a gym, to get the circulation back, but they are still bruised. Frank: Any other observations you’d care to share with us about your Police experience? Do you think their detention of you was excessive? Darren: Yes it was excessive. They didn’t need to handcuff me, they didn’t need to take every single personal item off me – what harm could I have done with my ear rings, for example. They could have asked if I wanted a glass of water or to make a telephone call. I had an ice coffee in my satchel, which they could have asked if I wanted to drink etc. The cell had a thin rubber mattress and a metal toilet, but that was all. They also didn’t need to hold me for two hours after processing me. Frank: Will you lay a complaint with the Independent Police Complaints Authority, do you think? Darren: Probably not. No photos were taken of my wrists and the cuffs did not draw blood or cut off the circulation. No charge was laid against me and I don’t want to aggravate the police to change that decision. Frank: Ok. Lastly, has this put you off taking further protest action do you think? Frank: So we’ll see you on the next protest action then? Darren: It depends upon what the next action is, but if the issue is important enough I will be there. But I guess National ministers pretty well do whatever they like these days. The law doesn’t apply to them, obviously. 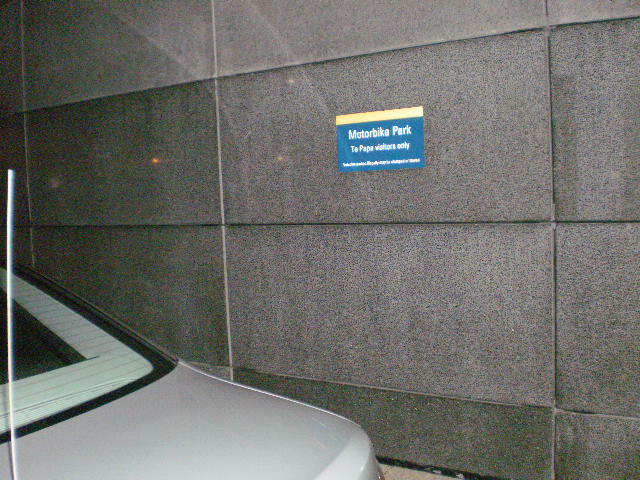 As I took these photos (on my way to my legally parked car, for which I had to pay a car-parking fee), Darren was still locked in the police paddy-wagon. For him, the law meant hand-cuffs. 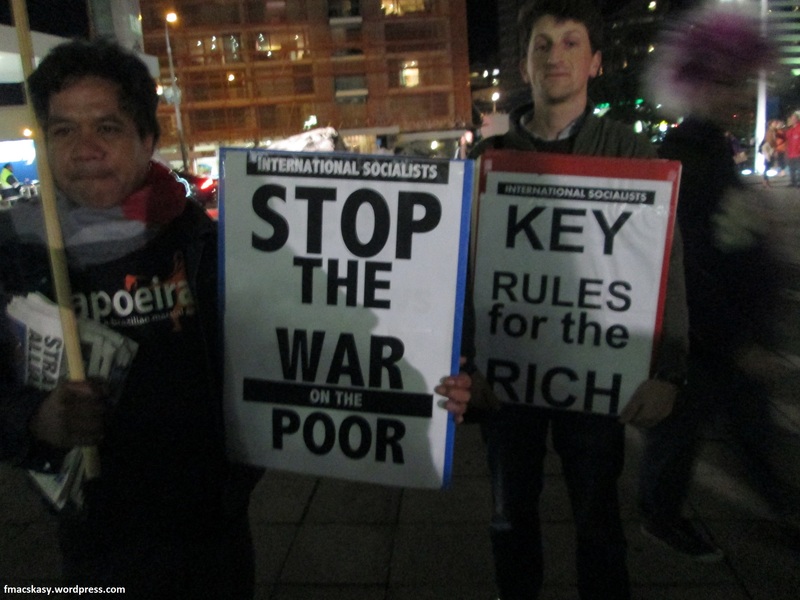 This blogpost was first published on The Daily Blog on 1 July 2014.